Given that this blog is essentially about looking at art, it seems like a good idea to think about how that happens. 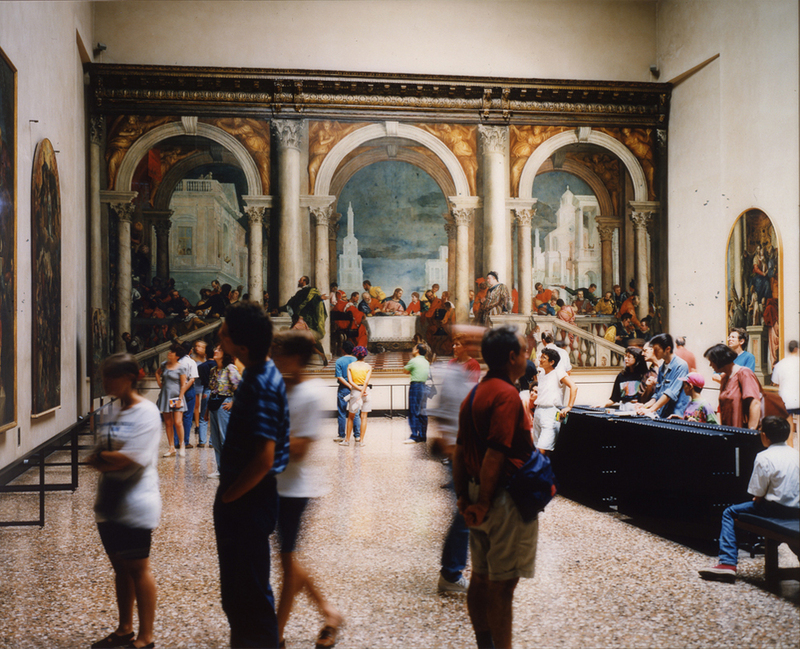 Thomas Struth’s museum photographs provide a fascinating insight into the way visitors behave in art museums. In most of the pictures, viewers are looking at historical paintings, or sometimes sculpture, and we are looking at them. 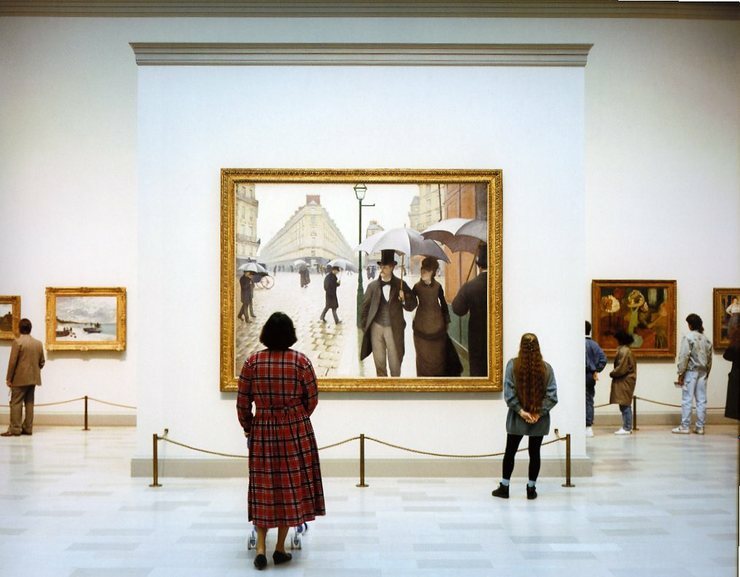 Struth typically adopts a broadly objective viewpoint, for instance in Art Institute of Chicago II we are looking straight at Gustav Caillebotte’s Paris Street; Rainy Day (1877) and at the backs of those looking at it. The painting’s audience is two individual women, each seemingly lost in their own thoughts about the work in front of them. 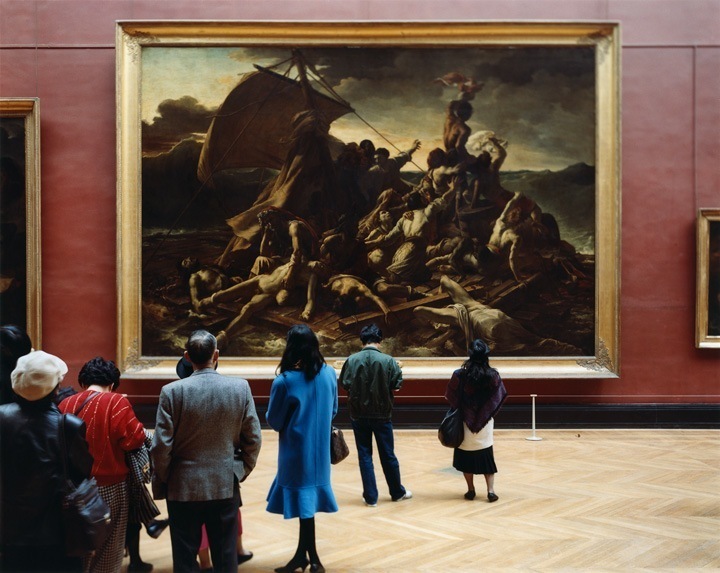 At the Louvre, Struth records half a dozen people looking at Théodore Géricault’s The Raft of the Medusa (1818-19). The dynamic here is slightly different. From the angle of their heads, it seems two audience members may be reading about the painting in a guide book. The woman in blue is slightly turned towards the man next to her, suggesting they may be there together. Once again, even though we are seeing people from behind, there is a palpable sense of concentration. Here the group gathered before the painting – Deigo Velásquez’s Las Meninas, a painting in which Velásquez himself constructs a complex relationship between artist, subject and audience – is large, a guide is gesturing towards the work as she explains it to the group. Though most seem focused, at the front of the photograph two young boys on the periphery of the group are ignoring the proceedings; one looks towards the camera. It seems probable that the boys are at the museum with their parents but have become bored of looking at painting, or at very least distracted by the camera. Struth’s photographs encourage speculation about those who populate them based in part on the evidence before us and in part on our own experience of art museums. When Struth turns the camera face on to the audience we are presented with the opportunity to read the expressions on the faces of the museum visitors. 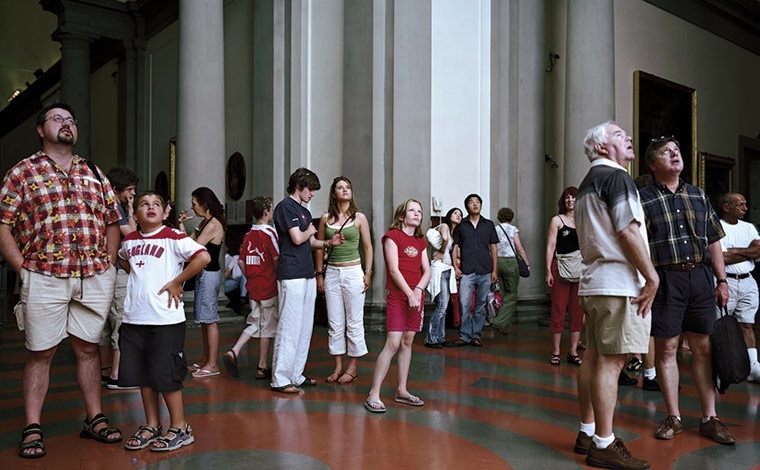 There is wonder and boredom and everything in between in these photographs, but it’s the posture that interests me more and the relationship between the individuals and the crowd. 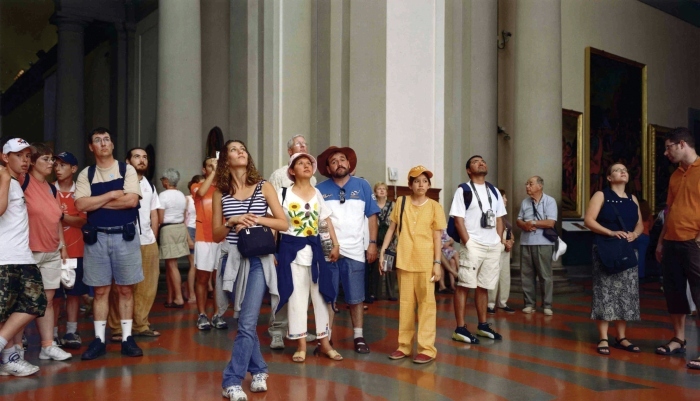 It’s also striking, though perhaps unsurprising, that these museum visitors are more obviously tourists; it’s mainly the shorts and sandals, but the cameras add to the evidence. Struth’s museum pictures fascinate me not least because, although I like people watching, in art museums I am usually one of those gazing at the art. There is also something compelling about photographs that are large enough to feel as though one is there in the space; in this respect the pictures where we, as the observers, stand behind those we observe work better but the pictures where we face the art audience are more challenging in other respects. There is a lot to think about in these pictures in terms of the architecture of museums and the way in which art is collected and displayed. Ultimately though, it’s all about looking. 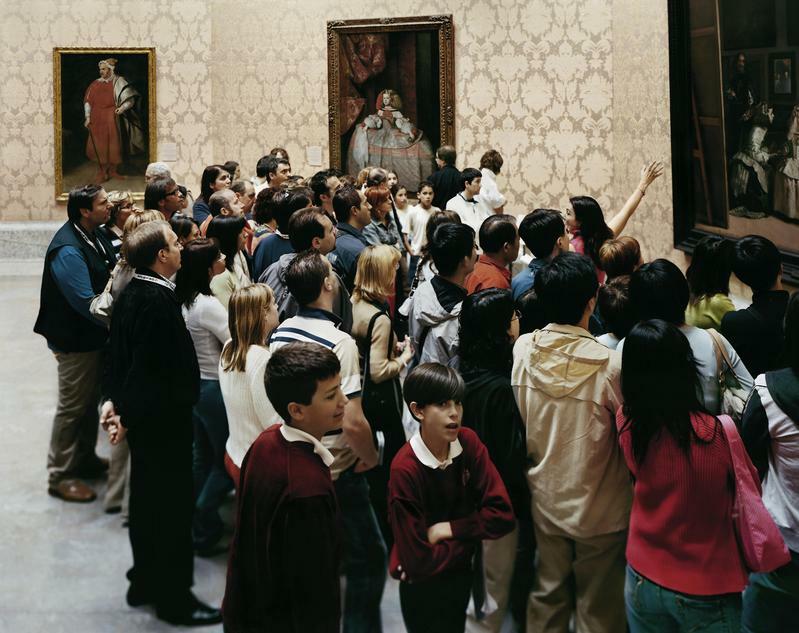 This entry was posted in Photography and tagged art, Art Institute of Chicago II, audience, Audience 6 Florence, Audience 7 Florence, Galleria dell'Accademia Venice, Musée du Louvre Paris IV, Museo del Prado 8-1, museums, photography, Thomas Struth by Ann Jones. Bookmark the permalink.